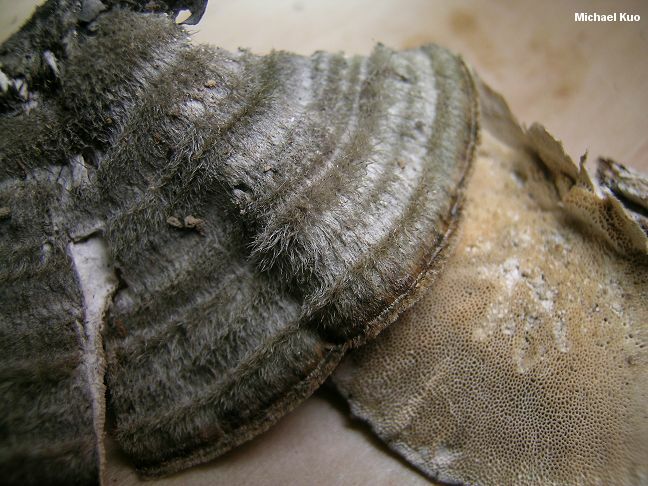 Yet another turkey tail look-alike, Trametes hirsuta features a whitish and grayish, hirsute cap surface. 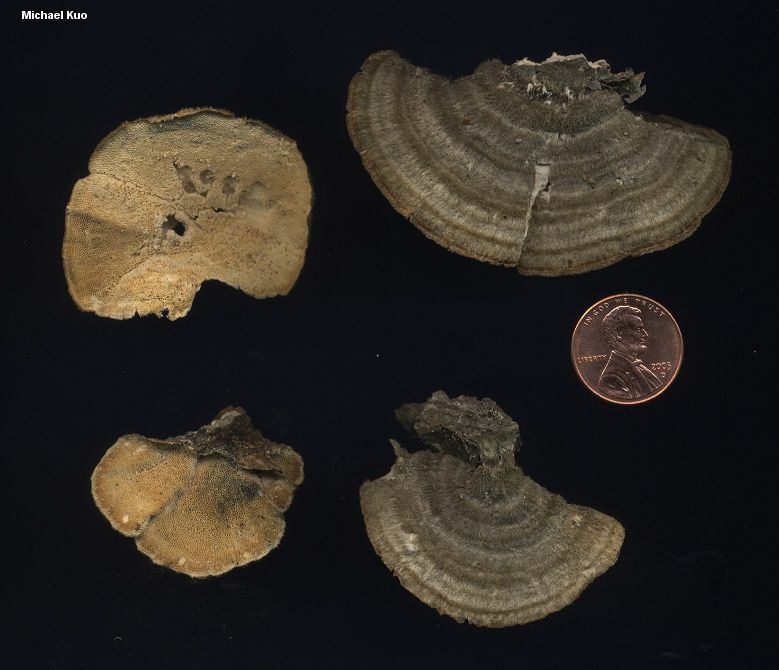 Its margin is often brownish, which helps to separate it from Trametes pubescens, which can sometimes look similar (and which is also usually a little less hairy)--and its pore surface features 3-4 circular to slightly angular pores per mm, which separates it from Trametes villosa, which has larger pores that become strikingly angular and nearly tooth-like. Ecology: Saprobic on the deadwood of hardwoods (very rarely reported on conifer wood); annual; causing a white rot; growing in clusters on logs and stumps; summer and fall; widely distributed across North America. 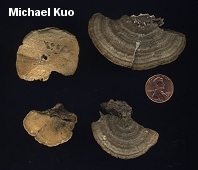 Cap: Up to 10 cm across and 6 cm deep; semicircular, irregularly bracket-shaped, or kidney-shaped; often fusing laterally with other caps; very densely hairy; often finely, radially furrowed; with concentric zones of texture; zones with gray, whitish, and brownish shades, but usually not contrasting markedly; margin often brownish to brown or blackish. Pore Surface: Whitish, becoming a little brownish, grayish, or yellowish with age; with 3-4 circular to angular pores per mm; tubes with fairly thick walls, to 6 mm deep. Chemical Reactions: KOH on flesh negative to dull yellow. Microscopic Features: Spores 6-9 x 2-2.5 µ; smooth; cylindric; inamyloid. Cystidia absent. Hyphal system trimitic. Coriolus hirsutus is a synonym. REFERENCES: (Wulfen, 1788) Lloyd, 1924. (Fries, 1821; Saccardo, 1888; Overholts, 1953; Arora, 1986; Gilbertson & Ryvarden, 1987; Barron, 1999; McNeil, 2006; Binion et al., 2008.) Herb. Kuo 07300911, 10110902.